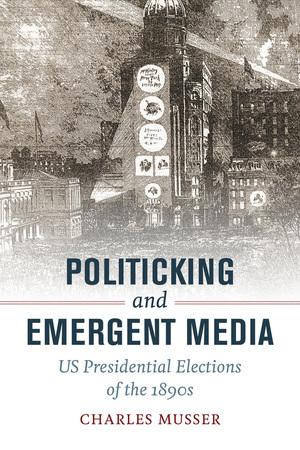 Presidential campaigns of the twenty-first century were not the first to mobilize an array of new media forms in efforts to gain electoral victory. In Politicking and Emergent Media, distinguished historian Charles Musser looks at four US presidential campaigns during the long 1890s (1888–1900) as Republicans and Democrats deployed a variety of media forms to promote their candidates and platforms. New York—the crucial swing state as well as the home of Wall Street, Tammany Hall, and prominent media industries—became the site of intense struggle as candidates argued over trade issues, currency standards, and a new overseas empire. If the city’s leading daily newspapers were mostly Democratic as the decade began, Republicans eagerly exploited alternative media opportunities. Using the stereopticon (a modernized magic lantern), they developed the first campaign documentaries. Soon they were exploiting motion pictures, the phonograph, and telephone in surprising and often successful ways. Brimming with rich historical details, Musser’s remarkable tale reveals the political forces driving the emergence of modern media. Charles Musser is Professor of American Studies and Film and Media Studies at Yale University. He is the author of The Emergence of Cinema: The American Screen to 1907 and producer of the documentary Errol Morris: A Lightning Sketch. 2. The Stereopticon: Platform or New Media Form? When Did Cinema Become Cinema? From Early Cinema to Media Archaeology?